Featured image: Dow-Bull Brook Trail, from the Essex County Trail Association site. Dow Brook was probably named after early Ipswich settler Thomas Dow., who possessed Dow’s Pasture “at the edge of Town.” Dow Brook flows south from near the Rowley line. 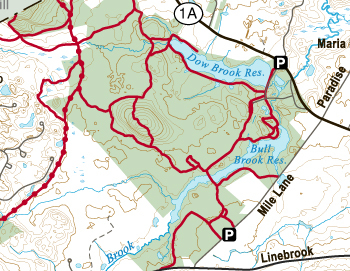 Bull Brook originates in Willowdale, crosses Linebrook Rd. and merges with Dow Brook at the Ipswich Utilities site on Rt. 1A. From that point the combined stream becomes the Egypt River. Remnants of the old grist mill and saw mill dam on the Egypt River, originally constructed by Nehemiah Jewett, are behind the Ipswich power plant transformer station on High St.
Harold Bowen wrote that two downtown fires in 1894 accomplished something that numerous Town Meetings had failed to agree upon. For several years the town had tried to provide a municipal water system, without success. “The farmers up in Linebrook fought it. 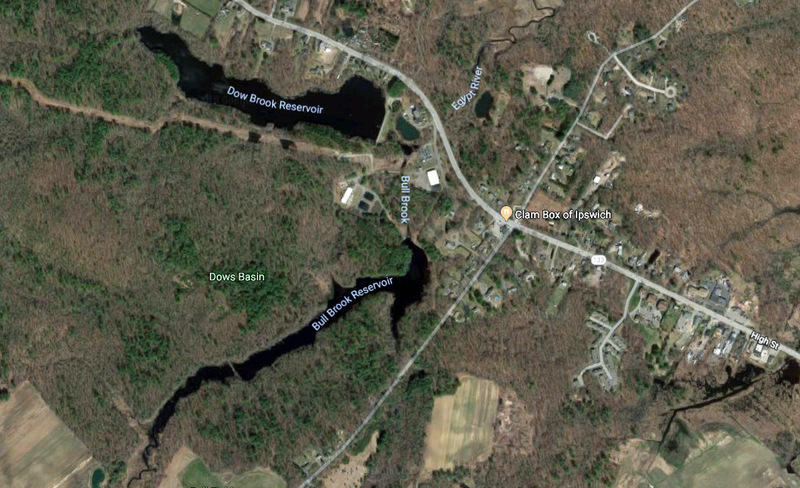 It was planned to use Bull Brook. But the farmers said if they did use the brook, they would not be able to let their cows out because the cows would drink all of the water in Bull Brook. 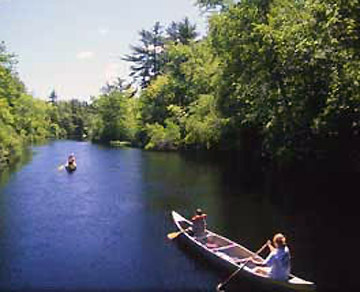 “The need of a proper supply of water for the Town for all purposes had become so evident that by vote of the Town on March 4, 1889, the Selectmen were instructed to petition the General Court for permission to take water from Hood’sPond (aka Pritchett’s Pond), which was amended on April 22 to include any source from which water might be obtained. The Legislature passed an Act, giving the Town authority to proceed, which was accepted on Sept. 14, 1889, and a Committee of seven was appointed to examine various sources. Their report in favor of a system of driven wells was rendered in March, 1890, and was adopted. A new Water Act was passed by the Legislature on May 23, 1890, but the Town meeting called to consider its acceptance on Sept. 15, voted that any action be indefinitely postponed. Another meeting was called on Sept 29 and a vote was taken by ballot, using the check list. It resulted in 139 Yea, 106 Nay, but failed to secure a two-thirds vote. Another meeting was called on Jan. 26, 1891, which cast 182 votes in favor, 174 against. On May 9, 1892, the Town voted on the acceptance of the Water Act, the polls being open from 8.30 to 10.30 P. M. The ballot, 242 Yes, 123 No, showed a decided gain in favor of acceptance, but failed of the necessary two-thirds by two votes. On May 20, 1892, 314 votes were cast in favor and 177 against, showing an increased public interest, but failing again by fourteen votes. Again on Nov. 28, 1892, 327 voted Yes, 186 No, lacking fifteen of the requisite number. As the time for acceptance under the provisions of the Act of 1890 had now expired, the Town voted on Jan. 31, 1893, to petition the Legislature to continue the Act in force for three additional years. All of the buildings on Central Street from the corner of Market St. to Wildes Court were destroyed by fire on January 14, 1894. No further action was taken until Feb. 19, 1894, when ballots were cast on the acceptance of the Act passed by the Legislature on March 29, 1893. Opposition had ceased almost entirely, as 660 votes were cast, 472 being in favor. At the Town meeting on March 19, 1894, shortly after the destructive fire in Central Street, it was voted that the Town buy a steam fire-engine and $3500 was appropriated. Water Commissioners were chosen on April 23, 1894, Everard H. Martin for three years, William S. Russell for two years, Walter E. Lord for one year. Action had not come soon enough to save the Damon Building at the corner of Market St. and Depot Square, which burned to the ground on April 17. 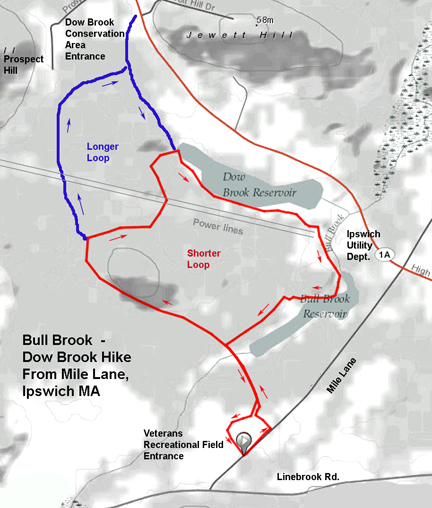 Dow’s Brook, with an emergency use of Bull Brook, was decided upon as the source of supply. The work of construction was pushed rapidly and was so far completed that an exhibition of the power and adequacy of the hydrant service was made on Thanksgiving Day, 1894. The water proved to be of excellent quality for domestic use, and the supply has proved equal to the public need in the driest seasons. The municipal water plant proved so satisfactory that in a few years the question of municipal light began to be agitated. A private Gas Light Company had been incorporated in the Fall of 1877 and pipes were laid and business begun early in the following year. Only a limited area in the center of the Town was covered and a few streets were lighted. Notwithstanding the plant was enlarged in 1890, the provision for street lighting remained very inadequate, though the churches, shops and many residences were well supplied. Ipswich power plant, photo by George Dexter, early 1900’s. 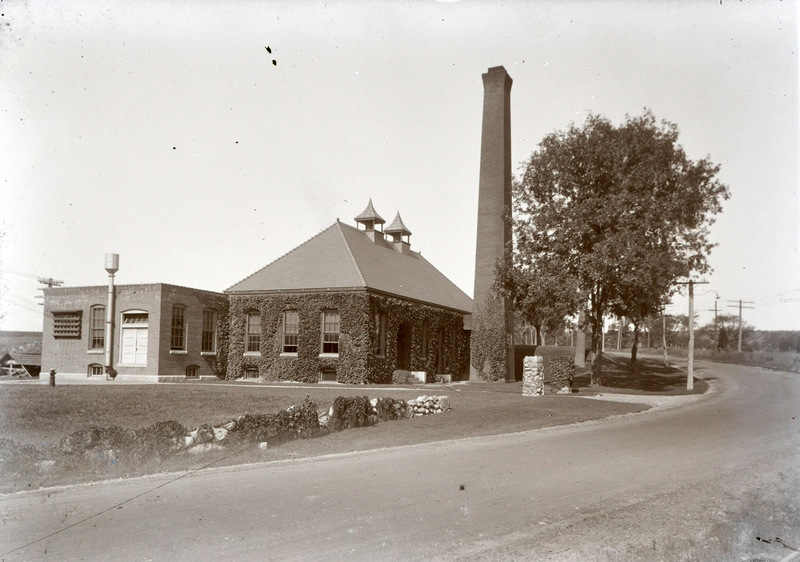 The question of constructing a municipal electric light plant at the Pumping Station was decided affirmatively by the Town on May 27, 1901, and the enabling Act of Legislature was accepted by a vote of 205 Yes, 90 No, on Sept 23, 1901. On April 18, 1903, the Town voted 307 Yes, 68 NO, to build the plant and issue the necessary notes. A Committee to construct the plant was chosen on April 18, the Selectmen, George A. Schofield, Charles E. Goodhue and Charles G. Hull, and two citizens, Charles A. Campbell and Walter E. Lord. On Wednesday night, November 18, 1903, the dynamo was started and the streets throughout the Town were brilliantly illuminated. A single Board of Water and Light Commissioners was chosen on April 23, 1904, William H. Rand for three years, George H. W. Hayes for two years, George A. Schofield for one year. Mr. Schofield had been the foremost and constant advocate of the public water supply, and had rendered valuable service in the construction of the lighting system. Upon the expiration of his long term of service as Selectman and Chairman of the Board, he became the Chairman of the Water and Light Commission. This three-mile hike begins at Veterans recreational field on Mile Lane near Linebrook Road in Ipswich. From the parking lot enter the path on the far side of the baseball field. The trail soon crosses a bridge that separates the larger section of Bull Brook Reservoir from the brook and estuary at its southwestern tip. Bear left on the trail to continue through a hardwood/evergreen forest. As you cross under the utility wires you can explore a large granite outcropping in on the right. At the next fork you have the option to bear left and continue for a longer option. This can also take you to the Dow Brook Conservation Area entrance near White Farms Ice Cream at the Rowley town line. After a couple of right turns you reach an intersection at the end of Dow Brook Reservoir where the shorter and longer options rejoin. Continue walking on the wide path along Dow Brook Reservoir until you again reach the power lines at the Ipswich end of the lake. There are no signs here and finding the trail that continues back to Bull Brook can be confusing. Turn left to the utility department road and then enter the path again through the gated gravel road behind the water treatment building. You can see Dow Brook flowing on the left and you’ll soon come upon its spillway. A narrow path continues along the lake, or you may take the wider path on the right. The trail comes back to a fork near the Bull Brook bridge you crossed over earlier, and then retrace your steps on the path back to the ball field. The total distance for the shorter version of this hike (shown in the map below) is about 3 miles. Add another mile for the longer loop. Birders may wish to continue the walk to the far corner of the recreational field where an unusual number of songbirds congregate near the wetlands. 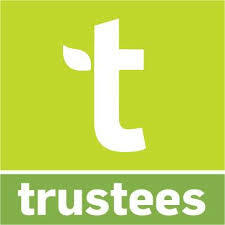 Read more about trails and conservation areas at the two reservoirs at the Essex County Trails Association (ECTA) site.